Arts as curriculum, when art and art-making are the primary focus of a learning experience. Participants learn in and about the arts. Students study the roots of a specific genre of dance, investigating where, how and why the genre came to be. Students then collaboratively learn and/or choreograph a movement sequence in that genre. Arts-enhanced learning, when an art form is used simply to teach something else. Children sing the alphabet song in order to memorize their letters, and possibly learn to enjoy singing, but no time is spent on understanding or developing skill with music. 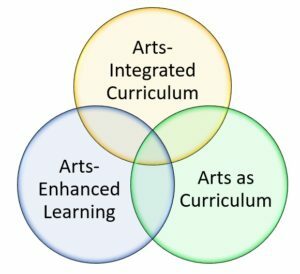 Arts integration, defined by the Kennedy Center as “an approach to teaching in which students construct and demonstrate understanding through an art form. Students engage in a creative process which connects an art form and another subject and meets evolving objectives in both” (Silverstein & Layne, 2010, p. 1). See other definitions, such as Preparing Educators for Arts Integration (Diaz & McKenna, 2017). Since the focus of the Framework is arts integration, it might be helpful to investigate this definition with a little more depth. An approach to teaching: Arts integration is as much about how we teach as what we teach. Arts integration is effective because the arts engage participants on personal, social and educational levels, which can make for joyful and meaningful teaching. Students construct and demonstrate understanding through an art form: Construct suggests that participants are deeply engaged in the art discipline, having the opportunity to imagine and develop personally relevant work that helps them demonstrate insightful understanding of the learning targets. Engage in a creative process: This seems obvious, but the word creative can be deceptive. Participants develop the skills and understanding to create art work that reflects their own ideas, opinions, understanding and interests, not simply carry out the directions of the classroom teacher or teaching artist. Connects an art form and another subject: The key word here is connect. An arts integrated learning experience points out and explores natural and relevant connections between an art discipline and a subject of focus. It moves beyond arts-enhanced learning to engage participants in rigorous artistic practice that helps participants gain insight into and understanding of the connected subject and, ideally, gain deeper insight into and understanding of the art form through the connected subject. Meets evolving objectives in both: The art discipline and the connected subject are equally represented in the learning experience through relevant purposes, standards and learning targets related to each. This suggests that both teaching artists and classroom teachers give weight, time and focus to both art discipline and connected subject, to ensure participants gain meaningful skills and knowledge in both.